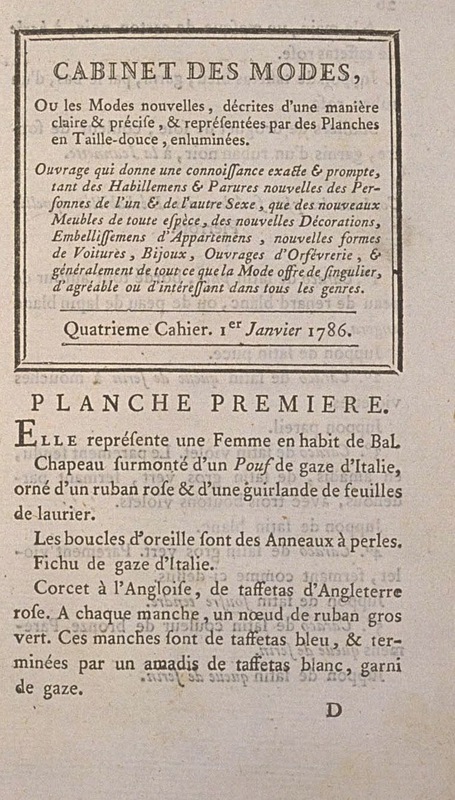 It represents a Woman in Ball dress. Hat surmounted with a Pouf of Italian gauze, trimmed with a pink ribbon and a garland of laurel leaves. The earrings are pearl Rings. 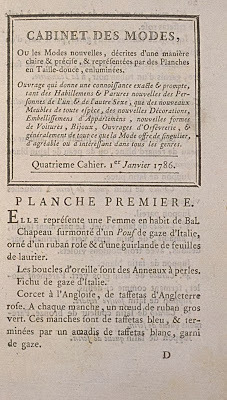 Corset à l'Anglaise, of pink English taffeta. On each sleeve, a bow of dark green ribbon. These sleeves are blue taffeta, and end in an amadis of white taffeta, trimmed with gauze. In the hand, a mask of black card, with beard of pink taffeta. Petticoat of blue taffeta, trimmed, at the bottom, with a pink ribbon. Shoes of silk drugget, sulfur-colored, trimmed with a black ribbon, à la Jeannette. 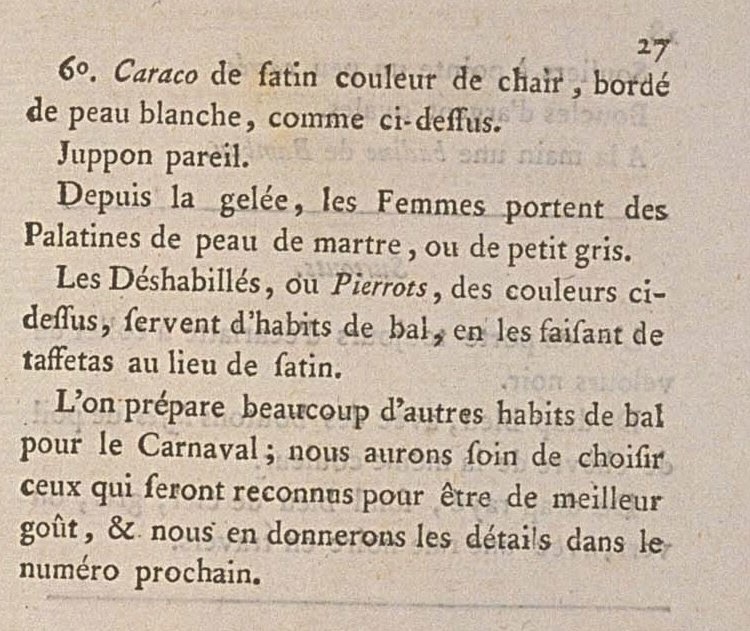 The freshest colors of the Déshabillés called Pierrots. 1st. 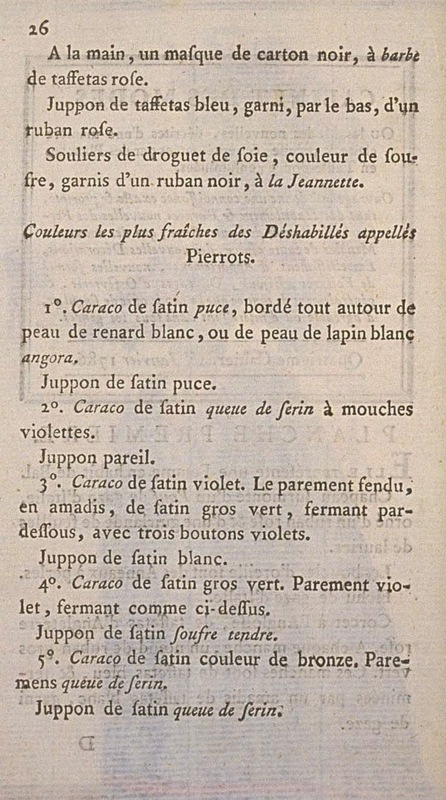 Caraco of puce satin, edged all around with white fox fur, or white angora rabbit fur. 2nd. Caraco of canary's-tail satin with violet spots. 3rd. 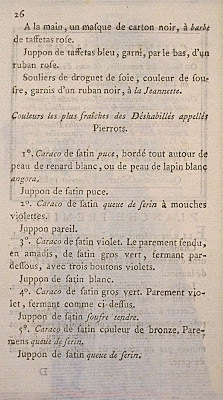 Caraco of violet satin. The split parement, en amadis, of dark green satin, closing in front, with three violet buttons. 4th. Caraco of dark green satin. Violet parement, closing as above. Petticoat of soft sulfur satin. 5th. Caraco of bronze-colored satin. Canary's-tail parements. 6th. 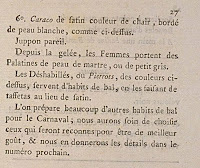 Caraco of flesh-colored satin, edged with white fur, as above. Since the frost came, Women wear Palatines of marten, or squirrel. 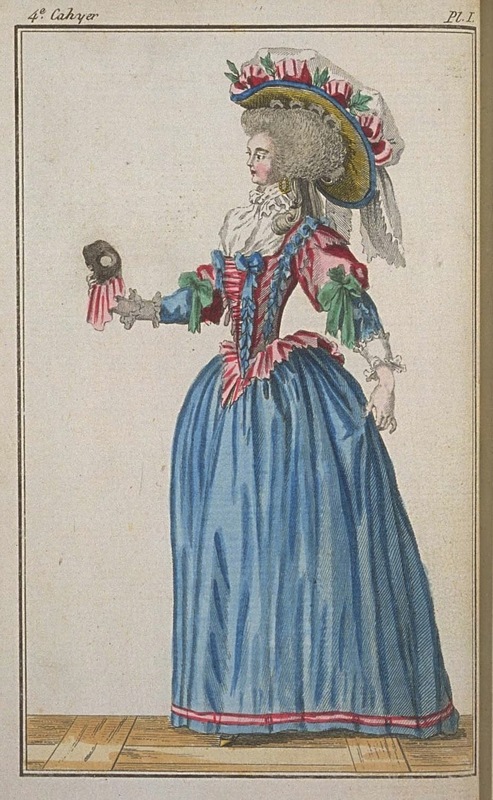 The Déshabillés, or Pierrots, of the colors above, serve as ball dress, when they are made of taffeta instead of satin. Many other ball dresses are prepared for Carnaval; we will have concern for choosing those which will be known in order to be of better taste, and we will give their details in the next issue.